Thugs of Hindostan Behind The Scenes Bonanza! 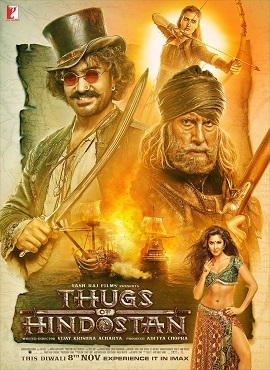 The Thugs are about to sail into a theater near you very soon! Starring the incredible cast of Amitabh Bachchan and Aamir Khan, along with Fatima Sana Shaikh and Katrina Kaif, the Vijay Krishna Acharya directed movie is the biggest visual spectacle that boasts of a larger than life, never seen before action extravaganza that it not to be missed! Mounted on a massive scale, Thugs of Hindostan is set in the early days of The British Raj in 1795 India. The East India Company came as traders but now rule India. Some like Azaad (Amitabh Bachchan) choose a life of a rebel and face certain death if captured, rather than bow to a life of slavery. Others like Firangi (Aamir Khan) would sell their mother for a profit, their only master is money. When Firangi is enlisted to deliver Azaad in to the jaws of death by John Clive (Llyod Owne) for the Company, Firangi sets out to pull off the biggest Thugee (In translation: Con) of his life, facing his most worthy adversary yet. We have not 1 or 2 or 3 but 4 cool BTS videos for you! They also shot in Taiwan and had some unexpected guests! Now we meet the two main Thugs and see how these two iconic actors worked together! Finally we take a look into the incredible detailed work that went into making the costumes for each of the characters! For Aamir’s Firangi: “Firangi is a potpourri of different elements and identities stolen from the myriad people he meets. He loves his name and lives up to it with his top hat and his choice of foreign booze, which also are incidentally stolen from people. He wears an English leather tail coat in a jade colour, the colour of a chameleon,” say designers Rushi and Manoshi. “Like a magpie, he loves collecting things that shine to his eyes. He has a chatelaine belt from which he hangs his favorite glinting belongings. A rose-tinted sun-glass, an ornate leather canteen of water, a mismatched pair of boots and a ‘potli’ full of tricks, beware of the charmer, Firangi Mallah!” they add. In creating the look for Aamir Khan’s character Firangi, a flamboyant, wily, deceptive smooth talking thug, the actor was minutely involved in the research and design. “For Firangi, what we figured is that other than the dhoti that he wears, everything else is robbed from someone! Whether it’s his hat, sunglasses, shoes, jacket, everything has been flicked.” he adds. While for the incredible look and costume for Mr Bachchan, costume designers Rushi and Manoshi researched for months to design his unique look that combines armour, leather and the traditional dhoti pants.“Our brief for Khudabaksh was that of a warrior who is a farmer at heart. This character has very contrasting personalities. Our costume spoke this brief aloud. We have given him a kurta and the dhoti is absolutely kisan like. The kurta has a cotton and a linen rib with a mulmul lining to give it that softness and on top of that we have given that hard armour which brings out the fierceness of a warrior of Khudabaksh’s stature,” they explain. Check out this cool BTS video to find out more! Get ready for high adventure with Yash Raj Films Thugs of Hindostan when it hits theaters on November 8th! We know we will be first in line! 15 queries in 0.353 seconds.